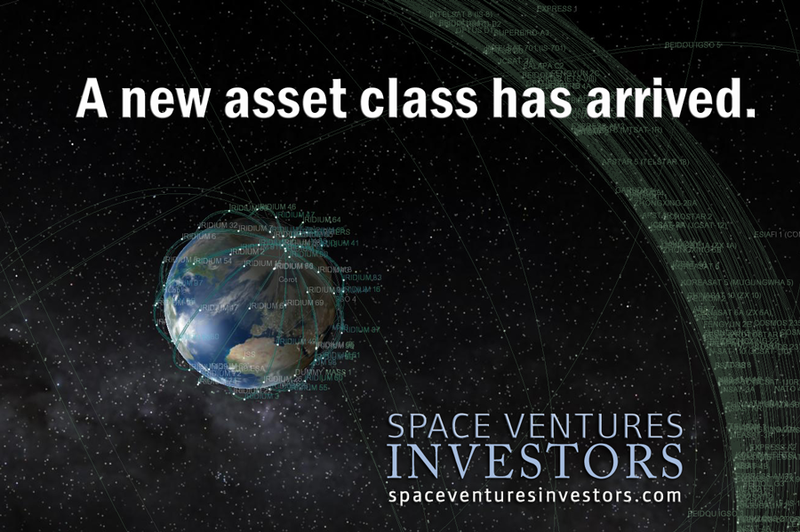 Investing in Space Companies for Entrepreneurs, Angel Investors, High Net Worth Individuals, and Family Trusts. At Space Ventures Investors we find space companies that fit our Space Commerce Road Map. Our strategy is to map the path of progress ahead and find various ways to match the goals of space investors and the space entrepreneurs who need capital. For High Net Worth Individuals in Space, there are exciting options to make a sizable investment in early stage space companies that are pro-actively riding the next wave. The difficulty of producing qualified and market-ready space technology is that it is a difficult process, yet the space industry has a vibrant, educated, sophisticated and business-savvy start-up scene. This Space Scene is it an early stage, and vastly different to the Dot-Com era start-up, or that of the Social Media start-ups; both had the benefit of un-tested valuations until the market self corrected. In contrast, space companies carry the burden of past performances, be it explosions on launch-pads, the threat of space debris, or their planned competitiveness vs. legacy equipment. There are many factors to be modelled when applying for Seed, Series A & B funding. This screening out process for raising investments for space start-ups in turn creates a critical environment for the brightest minds to come together to solve extremely challenging problems, and at the same time push the boundaries of the next frontier. SVI is actively seeking strategic investors who can also offer experience and advice. Many new Space Companies have business models that are based on or similar to existing high-tech, small-scale, niche manufacturing and software development businesses. The parameters and standards already exist on which to measure space companies. Most entrepreneurs and early stage investors see an opportunity, a process, design or system that needs to be competed, and the people to do it. New space companies are no different to any other enterprise. There is a pool of available specialists thanks to space being an industry over a half century old, and newcomers from the high-tech Universities. The last 20 years of globalisation has created a massive flow of technology, from niche hardware and software, that can be combined for different purposes and business models. Space was expensive and price is no longer the main barrier to entry. The most difficult aspect for space companies is to find capital to really be disruptive, that is to boldly go where few entrepreneurs have gone before. 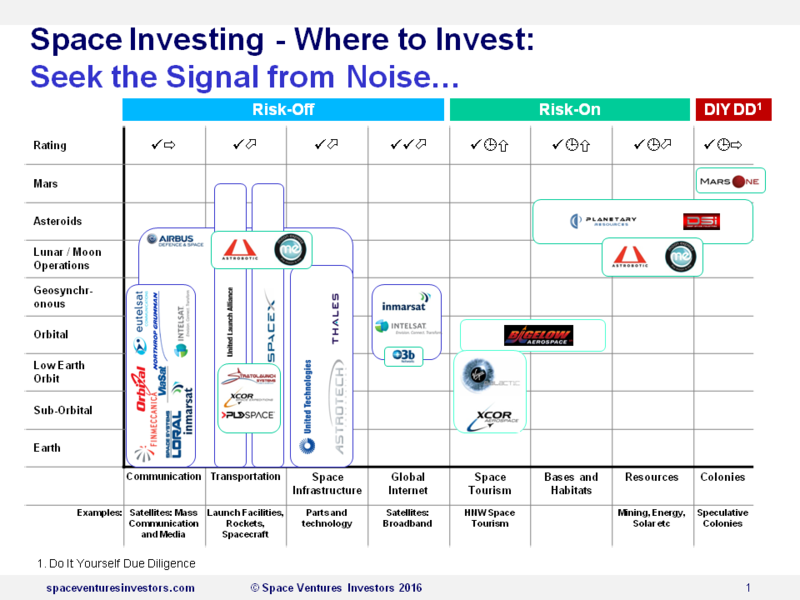 For a custom overview of your HNW investing strategy, get in contact with Space Ventures Investors. Our internal Space Investment Research has a focus on what current space technology is profitable and what future space technology will be profitable, including adjustable timelines. Some of our ideas are outlined in our Space Commerce Presentation and Space Road Map; The majority of which is our basis for investing in space, how, when and why. Hedge your investments in space - Advances in hardware, software, plus the rising consumer demand for space applications, is creating an exciting investment opportunity. Meet the Space Entrepreneurs behind Space Ventures Investors.